One marital asset that can prove to be difficult to divide in a divorce is ownership interest in a business. Whether a couple owns and runs a business or simply owns an interest in the business, if the interest in the business qualifies as a marital asset, it has to be divided along with all the other marital property in the divorce. If only one spouse is involved in the business, the first issue that is likely to arise in the division of a business in a Florida divorce is whether the business interest owned by one spouse is marital property. If the spouse owned an interest in the property before marriage, the interest may be considered non-marital property. However, if the spouse put in labor to grow the interest in the business during the marriage, the interest or a portion of it may be considered marital property that can be divided in a divorce. If both spouses are the only shareholders in the business, they can decide to continue running the business together even after the divorce. This option can save an otherwise profitable business from being dissolved in order to be divided between divorcing spouses. If the couple chooses this option, they may have to draw up new documents to reflect any changes in how the business is run. 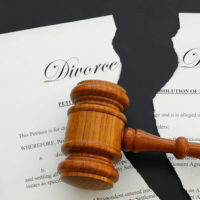 When a business is to be divided as part of the divorce, the court has to receive evidence as to the value of the business in order to properly divide the interests. This valuation is typically done by a certified accountant, and either spouse may present a different value based on the method of valuation the accountant uses. After valuation and a determination of each spouses share in the business, the court may order one spouse to buy out the other spouse. With a buy out, the spouse who is buying out the other spouse can complete the buyout in one lump sum payment, or work out payments in installments. Which option works best for the spouse will depend on how much they have available to complete the transactions, and sometimes on how much the spouse wants to get a clean break. For this reason, some people may opt to take out a loan or cash out retirement accounts to complete the buyout in one transaction. Prenuptial agreements can affect how a business interest is divided. If the spouses signed a prenuptial agreement excluding a business interest from marital property, then the courts can enforce this agreement unless there are other legal reasons to invalidate the agreement. Such exclusions of business interests are usually done to protect one spouse’s interest in a family business. If you own a business with your spouse, or if your spouse owns interest in a business, the division of these interests as part of a divorce can become complicated. You need an experienced attorney who can have the business properly assessed to ensure that you get your proper share of the business interest. For more information, contact an experienced Boca Raton, Florida divorce attorney at Law Offices of Schwartz l White for a consultation.